SPEAK FREELY: WHY UNIVERSITIES MUST DEFEND FREE SPEECH, by Keith E. Whittington. Princeton: Princeton University Press, 2018. 232 pp. Cloth $24.95. ISBN 978-0-691-18160-8. Reviewed by Wayne D. Moore, Department of Political Science, Virginia Tech. Email: wmoore@vt.edu. 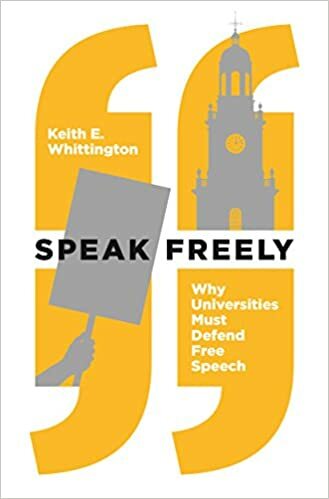 In SPEAK FREELY, prominent constitutional scholar Keith Whittington argues that universities in the United States should uphold free speech. This is a timely book on an important topic of widespread interest. Whittington’s analysis is cogent, crisp, well-reasoned, and widely accessible. Although many of his arguments operate at a more general level, Whittington is especially critical of current efforts to exclude conservative voices from university life. The preface frames problems of free speech with reference to efforts by students and “outside agitators” to silence and threaten conservative speakers. The final chapter urges universities to counter ideological ostracism and promote viewpoint diversity on campus by being more open to fuller representation of “thoughtful conservative scholars and teachers” (p. 178). Throughout the book, he criticizes universities for their predominantly left-leaning biases. The book has four main chapters. Chapter 1 articulates Whittington’s view of the primary mission of modern universities. While acknowledging that additional demands have been placed upon institutions of higher education, both historically and in the modern world, he emphasizes that “[a]t heart, the mission of a university is to produce and disseminate knowledge” (p. 13). In handling this and other issues, the book generally groups together public and private universities as well as colleges. Chapter 2 draws on two strands of political thought to support Whittington’s argument that free speech is integral to this mission of universities to produce and disseminate knowledge. Whittington identifies the first strand with Jeffersonian arguments that free speech is essential to “republican” governance. A key lesson learned from controversies involving the Alien and Sedition Acts of 1798, Whittington claims, was that a power to limit speech was likely to be abused, and thus “no one could be trusted with the power to suppress or punish controversial speech” (p. 36). Instead, at least within the political realm, it was best to “err on the side of liberty and let the people themselves hear all sides and weigh the value of the speech” (p. 36). According to Whittington, these arguments resonated with and reinforced important strands of “the liberal tradition” rooted in claims of individual liberty (pp. 36-37). More specifically, he relies on several branches of John Stuart Mill’s arguments in ON LIBERTY that support an expansive conception of principles of free speech based on its roles in advancing knowledge. In this context, Whittington also endorses U.S. Supreme Court Justice Oliver Wendell Holmes’ argument in ABRAMS V. UNITED STATES (1919) that “the best test of truth is the power of the thought [*35] to get itself accepted in the competition of the market” (p. 45). Shifting the metaphor, Whittington acknowledges that “[n]ot everyone is as optimistic [as Justice Holmes] about the power of truth to prevail in the marketplace of ideas” (p. 46). But he claims that “the university is precisely the type of environment where a ‘free trade in ideas’ is encouraged and ideas are placed in ‘open and free competition’” (p. 46). The heart of SPEAK FREELY is Chapter 3, titled “Free Speech on Campus.” This long chapter (about half the book) engages five sets of issues: trigger warnings and safe spaces, hate speech, forms of protest, student groups and outside speakers, and faculty and academic freedom. Whittington argues that while narrowly tailored trigger warnings and other content warnings have served valid functions in some contexts, they have become problematic once disassociated from specific medical diagnoses and expanded in university settings to shield students from challenging subject matter. Similarly, he argues that universities should encourage critical reflection in a manner that is civil, respectful, and tolerant of all – a goal hindered rather than advanced by seeking to protect students from exposure to uncomfortable ideas. Whittington argues that hate speech is neither harmless nor valuable but should nevertheless be tolerated unless it involves personal threats or harassment. He characterizes “staged disruptions” as largely unproblematic but opposes “actual disruptions” and “obstructions” that close down speech and otherwise impede university life (pp. 100-06). Whittington characterizes outside speakers as “relatively marginal features” of modern universities, and he argues that provocateurs “do not necessarily need or deserve a space on a college campus to advance their arguments” (pp. 116, 133). But he argues that universities may not engage in viewpoint discrimination, and he criticizes the withdrawal of invitations to controversial speakers based on the disruptive activities of protestors. He also denies that outside speakers – such as the white supremacists who marched through the grounds of the University of Virginia in 2017 – have a right to come to campus uninvited. In the final section of the chapter, Whittington claims that the academic freedom of faculty members is better secured now than it has been in the past, especially for those with tenure. He closes the chapter by arguing that “leaders in higher education” have a duty, comparable to that of judges, to “defend the principles of intellectual freedom against those both on and off campus who would seek to curtail such inquiries” (p. 160). In Chapter 4, Whittington expresses concerns about ideological ostracism and the lack of viewpoint diversity among university faculty. He claims that “for most purposes the political preferences of university faculty members have nothing to do with their work and how they conduct it” (p. 166). At the same time, he claims that the left-leaning bias of university faculties is problematic for a number of reasons. Among other issues, students must look beyond the campus to be able to hear conservative perspectives toward matters of public concern. When left-leaning obstructionists and censors seek to block these voices, they create threats to free speech of the sort chronicled in Chapter 3. In addition, the lack of viewpoint diversity has encouraged political backlash, especially among political conservatives who have “fanned the flames of mass resentment of the universities” (p. 176). Whittington urges universities to reduce the pressure for outside interventions addressing these matters by getting their own houses in order. He suggests, moreover, that greater representation of “thoughtful conservative scholars and teachers on college campuses is likely to encourage greater tolerance, engagement, and dialogue on campus and beyond” (p. 178). Many people will draw upon ideological perspectives to approach, read, and assess Whittington’s arguments. He invites such a perspective to some extent by identifying his own political orientations, criticizing universities for their left-leaning bias, and advocating greater inclusion of thoughtful “conservative” voices on university and college campuses. In addition, as indicated above, Whittington emphasizes ideological dimensions of many of the controversies that he cites in his book. In that vein, U.S. President Donald Trump recently issued an executive order directing designated federal agencies to “take appropriate steps . . . to ensure [that] institutions that receive Federal research or education grants promote free inquiry” (Trump 2019). The idea seems to be that colleges and universities may lose some categories of federal funding if they do not adequately protect free speech. This apparent threat of “outside” intervention is symptomatic of the increasing polarization and politicization of speech on university campuses and throughout society. While partisan lenses contribute in important ways to appreciating the contemporary relevance of Whittington’s analysis, it would be myopic to view and assess Whittington’s analysis only from those perspectives. SPEAK FREELY explicitly and implicitly raises and points toward a number of important and far-reaching questions about the purposes and functions of colleges and universities within the United States, their relationships to other social and political norms and institutions, how best to pursue and disseminate knowledge and advance other educational aims, the roles of speech within universities and the broader world, and justifications for banning or restricting speech both on campuses and elsewhere. These questions are of interest to those bringing to bear a full range of ideological, philosophical, and theoretical perspectives. Whittington’s most distinctive contribution in SPEAK FREELY is his joining an expansive understanding of “liberal” traditions of free speech to a view that the primary mission of universities is to produce and disseminate knowledge. That is both the distinctive strength and a significant limitation of the book. This tight focus enables Whittington to offer a relatively coherent and attractive normative vision of speech within universities. That vision is attractive in its emphasis on the importance of keeping pursuits of knowledge foremost within universities and in its articulation of principles of free speech that embrace a variety of viewpoints in a non-discriminatory manner. I also read Whittington as calling not only for tolerance but also for humility and mutual respect. I wholeheartedly endorse Whittington’s positions on these matters. In addition, the book is relatively balanced overall – noting, for example, that those on the political left, not only those on the political right, have been disadvantaged by ideologically-based restraints on speech. One set of issues surrounds Whittington’s emphasis on reasoning and rationality within forums of speech and within pursuits of knowledge more generally. This focus seems to rule out of bounds, at least for some purposes or in some contexts, irrational or non-rational invocations of faith, prejudice, passion, and even tradition. In addition, he seems to conceive of [*37] truth as objective in important respects. How do faith-based arguments and claims of knowledge and truth as subjective and/or non-unitary fit (or not fit) within Whittington’s conception of the primary mission of universities and his treatment of how speech advances that mission? A related set of issues surrounds Whittington’s reliance on the idea of a “marketplace of ideas” to sort truth from falsity. Whatever the scope of permissible speech, what are the essential preconditions for there to be “open and free competition” among a full range of ideas, what are the obstacles to achieving those ideals on college campuses (which, significantly, are neither “free” nor “open” to the public in many respects), and how might those obstacles be reduced or overcome? Taking these issues into account, what is Whittington’s response, beyond endorsing “free speech,” to those concerned about limits on access to higher education and the opportunities for expression and learning provided by that access? Likewise, how do Whittington and others engage concerns about the potentially distorting influences of economic power and other factors on the pursuit and dissemination of knowledge and truth, both within universities and within society more generally? At issue, among other things, is whether colleges and universities provide “marketplaces” open to all ideas on a relatively equal basis – or are they “markets” for speech and knowledge, treated as commodities and reduced to their instrumental value? These considerations return us to questions about the purposes of higher education. The flip side of Whittington’s tight focus on the mission of universities to seek and disseminate knowledge is that SPEAK FREELY does less than it might to explore the implications, in relation to claims of free speech, of more inclusive conceptions of the purposes and functions of colleges and universities. These institutions play important roles in developing and reinforcing capacities for the exercise of individual autonomy as intrinsically valuable, not only instrumentally valuable as a means of acquiring and disseminating knowledge; promoting skills and values of democratic/republican citizenship; and otherwise equipping individuals with skills necessary to thrive within domestic and international political, social, and economic environments. Advancing some or all of these goals need not be conceived either as orthodoxy of the sort Whittington opposes or as inherently antithetical to acquiring and disseminating knowledge. In any event, these additional understandings of the purposes or functions of colleges and universities provide supplemental perspectives supporting free speech and/or limits on its exercise and/or related activities. Interestingly, Whittington acknowledges that in other contexts outside of universities, speech has value insofar as it serves some of these same functions. More specifically, he explains that the First Amendment’s guarantee of free speech, in addition to being necessary for the pursuit of knowledge, is also necessary within the broader polity to secure the preconditions of democratic processes, check governmental power, and provide opportunities for authentic self-expression (pp. 29-30). He suggests, however, that it is not necessary for speech to serve those functions within universities because they have more limited missions; and, among other things, universities are not democratically governed (p. 131). He takes this position even though, as he notes, the First Amendment constrains the actions of administrators, faculty, and staff within state-owned and operated universities insofar as they seek to limit speech. This effort to isolate (1) speech on campus and “internal” reasons to value it from (2) “external” limits (such as the First Amendment’s legal prohibition) on efforts by some institutions and individuals to restrict speech, along with reasons for valuing that speech, is problematic. Versions of many if not all of the same reasons to protect speech outside universities similarly support protecting speech within universities, whether or not the First Amendment’s legal limits apply to those seeking to restrict the speech at issue. As a faculty member at a public land-grant university, it seems to me that developing capacities to exercise speech on campus, and in some cases the exercise of that speech, blends seamlessly with political speech outside the university; provides important vehicles for self-[*38] expression; is integral to gaining and exercising skills of effective democratic citizenship; contributes to the construction of constitutional identities that affirm the value of speech within academic and other communities; aids in the development of other attributes of citizenship along with skills of value within the political, social, and economic orders that include and extend beyond the university; and serves myriad other purposes beyond contributing to the pursuit and dissemination of knowledge. I see no good reason to isolate speech on campus – or arguments to encourage, value, protect, and otherwise promote it – from the roles speech plays within society more generally. Comparing speech within universities to speech within the broader polity is also instructive in other ways. Whittington argues that opposition by Jeffersonians to the Sedition Act of 1798 contributed to establishing the proposition that government should not restrict controversial political speech because of its alleged falsity or harmfulness. I agree with Whittington that opposition to the Sedition Act by Thomas Jefferson and others contributed to establishing and reinforcing ideals of limited governmental power in relation to political speech generally and political dissent in particular. But it is noteworthy that in his draft of what became the Kentucky Resolutions of 1798, Jefferson (1798) linked his arguments against restrictions on speech by the U.S. government to a premise that “all lawful powers respecting the same did of right remain, & were reserved, to the states or the people: that thus was manifested their determination to retain to themselves the right of judging how far the licentiousness of speech and of the press may be abridged without lessening their useful freedom, and how far those abuses which cannot be separated from their use should be tolerated rather than the use be destroyed.” In short, Jefferson argued that states, but not the U.S. government, had authority to restrict speech. Arguments that the U.S. government had no authority to restrict speech eventually became untenable, and thus by the early twentieth century it was widely taken for granted that some restrictions on speech by not only the states but also the U.S. government were valid. In this context, in his dissent in ABRAMS V. UNITED STATES (1919), Justice Holmes invoked the metaphor of a “free trade in ideas” in “the competition of the market” to criticize the enforcement of the Espionage Act of 1917, as amended by the Sedition Act of 1918, against Russian immigrants who opposed U.S. involvement in World War I. I agree with Whittington that this metaphor and its underlying logic support a relatively expansive view of free speech and a limited view of governmental power to restrict it. But in this same dissent, Holmes affirmed his position in SCHENCK V. UNITED STATES (1919), announced earlier that year, that the U.S. government could legitimately prosecute an individual for speech that allegedly created “a clear and present danger” of interfering with the U.S. government’s exercise of its legitimate wartime powers. In line with Holmes’ view (in a broad sense), judges and others in the modern era, whether rightly or wrongly, have generally taken a position that both the states and the U.S. government may legitimately restrict some forms of speech, at least in some contexts. As a result, the judicially secured “market” or “marketplace” of ideas has never, in practice, been open to all speech. Whittington largely brackets this issue of what coercive authority institutions of national and state governance may legitimately exercise in order to restrict speech within universities, along with parallel issues of university governing authority in relation to speech and other forms of expression. SPEAK FREELY argues solidly that speech has great value within universities and that universities should not restrict speech based on dogma or orthodoxy. Understandably considering its primary focus, this book offers less sustained analysis of what reasons (as distinct from enforcing dogma or orthodoxy) university administrators, faculty, and staff may invoke to limit speech or variants of speech (such as expressive conduct) within these institutions. Whittington seems to assume, for example, that universities may ban speech that amounts to harassment. How else may universities restrict speech and other forms of expression [*39] consistently with the First Amendment and other applicable laws as well as “internal” rules and policies designed to protect speech and otherwise promote the university’s multi-faceted mission? When do rights of free speech not apply, when do valid university policies preempt speech, and when should speech preempt otherwise valid university policies? Not surprisingly, we are in the midst of an outpouring of books, articles, blog posts, and other forms of commentary on speech within colleges and universities. A number of works focus on legal guarantees, such as the First Amendment, and explore how these guarantees apply on university and college campuses or may be extended to them, while others offer a variety of “internal” perspectives toward speech within these institutions. Both on its own and in conjunction with these related works, SPEAK FREELY offers distinctive and valuable timely contributions to thinking about the importance of speech both within universities and within society at large. I therefore enthusiastically recommend this book to a wide readership. Jefferson, Thomas. 1798. “Jefferson’s Draft of the Kentucky Resolutions of 1798, before 4 Oct. 1798.” In THE PAPERS OF THOMAS JEFFERSON 30: 536-43. Princeton: Princeton University Press, 2003. Reprinted at https://jeffersonpapers.princeton.edu/selected-documents/jefferson%E2%80%99s-draft (last accessed March 25, 2019). Trump, Donald J. 2019. “Improving Free Inquiry, Transparency, and Accountability at Colleges and Universities.” Executive Order No. 13864 (March 21, 2019). 84 Fed. Reg. 11401. https://www.federalregister.gov/documents/2019/03/26/2019-05934/improving-free-inquiry-transparency-and-accountability-at-colleges-and-universities (last accessed March 26, 2019). © Copyright 2019 by author, Wayne D. Moore.